Although this card didn’t start out to be this understated I’m happy with it all the same. As a matter of fact, if I’d set out to create a card that looked like this I’m not sure I would have been able to accomplish that task. The ribbon embellishment is a pair of 1 1/2 inch pieces that are loosely hand stitched along one edge and gathered slightly. The ends are drawn together and I’ve tied a knot to hold each short piece in a rough semicircle. They’re attached to the back of the oval with a bit of SNAIL and a second Soft Suede oval is adhered over the first, sandwiching the ribbons in place so they’ll be secure. 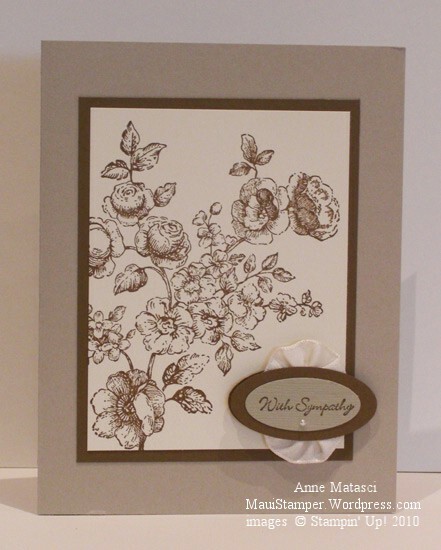 The completed embellishment is attached to the card with Stampin’ Dimensionals. Sahara Sand is an under-appreciated color in our palette. I need to remember to choose it more often.